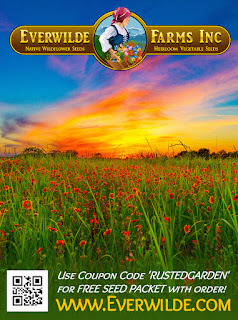 Subscribe to my YouTube Channel The Rusted Garden Over 800 Garden Videos Designed to Quickly Present Information! Sweet Potatoes can be easily grown in containers. You don't start sweet potatoes from seeds or from 'seed potatoes'. You start them from slips. You can easily grow your own by dropping a portion of the sweet potato in a container of water. Just like the old elementary school experiment. Use tooth picks to support the potato over a jar or glass of water, so it is submerged to 1/3 - 1/2 its size. Keep the jar full on a sunny windowsill and wait. It will soon start growing shoots that will become your slips. You want to start growing your slips about 60-90 days before they are ready to go into the ground. They get planted after the danger of frost has passed. You might get lucky and get slips in 30 days but it is best to start earlier. When your slips or the growth on you sweet potato get about 3-5 inches tall you can cut them off and drop them into their own glass of water. They will root quickly and be ready for transplant in about 2 weeks. I purchased my sweet potatoes from a local grocery store that sells organic vegetables. The 2 videos shows you all the steps for growing your own sweet potato slips. Sweet potatoes can be grown in 5 gallon containers. Generally speaking, the yield is smaller but you can still get plenty of delicious sweet potatoes. No matter what size container you choose, the set up is the same. Make sure you have holes in the container. Excess water has to drain from the container or the plant's roots will rot. The container soil can really be any basic bagged potting mix. You just need a simple mix that drains well. If you want to make your own you can use 50% soil and 50% peat moss or coco coir. A combination of the two is fine. You can also cut the soil to 25% and add in 25% of true compost. What I mean by true compost is any fully composted product, not one that is still breaking down. This video will give you some information on selecting containers. I recommend a balance fertilizer like a 5-5-5 NPK. Sweet potatoes are heavy feeders and you want to equally represent the phosphorous (5) and potassium (5) to a value at least equal to nitrogen (5) or even a little bit higher. Don't over stress with finding the right number. I use organic fertilizer with my potatoes when setting up the container mix for planting. Just follow the fertilizer package as directed. You don't want nitrogen to be over represented. You will have to follow, the basic soil set up, by feeding your sweet potatoes regularly with water soluble fertilizer. The water soluble fertilizers have NPK and other nutrients the are readily or immediately available to the plants. You will have to do this every 10-14 days and of course use less when the plants are small and more as the summer progress. Again you want to make sure the phosphorous and potassium are well represented. You can use an organic water soluble fertilizer but the chemical fertilizer are often more balanced. Your plant can't tell the difference but use what you are comfortable with. What I learned about harvesting is be patient and wait until the frost comes and takes the leaves. In Maryland Zone 7 you plant in mid May. You can plant in your zone once the danger of frost has passed. I was harvesting my sweet potatoes in September. I found letting them grow 4-6 weeks longer into October, when the first frost is arriving, made for larger sweet potatoes. Common sense to me now but you will see sweet potatoes breaking the surface in September and might be tempted to harvest them early. Simply put, wait till first frost. This is a guest post by Wendy Dessler. Wendy is a super-connector with My Seed Needs. Wendy frequently writes about the latest in the gardening trends world and tries to help novice and experienced planters grow. Gardeners everywhere enjoy the wonderful food that has been harvested from spring and summer crops. But, there are also crops of vegetables that can be planted now, in early fall and they will be ready to eat before winter. It is much easier to plant and tend a garden with the cooler days and the breezes keep the insects away. For a better variety of crops and a tasty winter season, see the list below. Beets are not always the favorite food on the table, but there are some great recipes that can be added to. They are a good source of vitamin C, Iron, magnesium, and a lot more. Snap beans and bush beans do well in the fall temperatures. Stay away from the pole beans. Beans are a great source of protein and they bring a heavy harvest so you will have enough to freeze or can them. They give you copper, a good mixture of the vitamin B family, and minerals. Broccoli is great when raw with ranch dip, or steamed. They are a vitamin powerhouse. Vitamin B1, B6, E, protein, zinc, calcium, iron, omega-3 fatty acids. This is just a small part of what adding broccoli provides for your health. Brussel sprouts will grow well until the first frost. At that point they are about finished for the season. They are a source of Vitamin C, vitamin K, Vitamin B1, folate, manganese, vitamin B6, dietary fiber, choline, copper, potassium, phosphorus and omega-3 fatty acids. Here is a list of veggies that will do well if planted now. Your seed provider can give you more information and variations. Kohlrabi (very fast growing food). Broccoli, Brussels sprouts, cabbage, cauliflower, kale, kohlrabi, and cauliflower seedlings, along with celery, bulb fennel, and parsley. carrots, collards, leeks, scallions, and radishes. Don’t forget you can direct sow lettuce too. It is not too late to plant and get a fall harvest. Speak to your seed distributor (see link above) for any advice you need. Remember there are varieties within each seed group. Make sure you order the correct variety. Prepare your soil before you plant. If your garden from spring had a mulch covering it remove it. The soil under it is good soil for growing fall plants. Just till it and remove any weeds that may be there. If you are unsure how to do that, there are plenty knowledgeable people on forums and communities that even sell parts of the equipment that can facilitate your job. You can add a layer of compost or manure to add some growing power to the soil. Taking care of you fall garden is much like taking care of your spring garden. You must keep the weeds away, and protect the plants from animals and insects. If you plan on using covers to protect the plants from early frost, get them now. You don’t want to be rushing around looking for them when the frost is predicted and all the other gardeners are out looking. Start now and look for a great harvest! Gardening is a global activity that is made up of, dare I say, some of the most wonderful people on the planet. We are happy with sunshine and dirt but gift giving can sometimes be a challenge. What do you get people that like the smell of compost, get excited by worms in their garden beds and can chat for hours about 1 inch tall seedlings? The short answer is anything garden related. And we all know its not the gift but the act of giving and that you care enough to try that truly matters. I did say "most wonderful people." Here is a list of ten ideas that make trying a little bit easier. Let's start with free. If you don't have the extra money to spend but have time, a wonderful gift and I might even say the best gift, is signing up the lucky gardener for a dozen or so free seed catalogs. We love them! Sometimes we don't have the time to sit down and subscribe. If you are concerned about using their address, use yours and bring them the catalogs when they arrive. Nothing beats the winter blues more than looking through seed catalogs. I have a list down the right side of my blog (I'll drop it here too) if you want to check them out. You can also just do a simple search and find a lot of seed companies that offer color catalogs. October, November, December are the months when places like Home Depot, Lowes and Walmart start putting all their garden products on sale. Here is a video that discusses it from my YouTube Channel - The Rusted Garden. You can really find products up to 75% off. It is a great way you give your gardener a gift of supplies for their soon to arrive spring gardening needs. Well... (shameless plug) I have a seed and garden shop where I sell a lot of garden products. One great organic product for stopping chewing insects is Neem Oil. It must be 100% cold pressed Neem Oil with Azadiracthin. This is so important because it is the Azadirachtin that kills chewing insects. This oil is considered organic. This video explains the difference in Neem Oil products. A lot of what you buy off the store shelves is a hydrophobic extract of Neem Oil. It is garbage. The video explains the difference. If you buy it from my shop or online, make sure it is a 100% cold pressed Neem Oil. All gardener's could use help in stopping damaging insects. We can never have enough sprayers in quart and gallon sizes. I sell an inverted sprayer and a 360 degree sprayer for quart containers at my seed and garden shop. Here is a video that shows you what they do. You can also pick up any of the different hand pump, 1 gallon or 2 gallon sprayers. We love them. Here are some sprayers you can find on Amazon or use as a guide. The 'hand' pump sprayers are outstanding as the are pressurized and allow for easily spraying the undersides of leaves. The ones I include here are the most common and needed types. Seeds, need I say more. What kind do you buy? Well the easiest way is to buy seeds that will surprise the gardener you know. You can do this by getting something that is new to the market. I've done work with All-America Selections and they do yearly seed trials to find the best new plant varieties on the market. They don't sell the seeds, they just declare plants AAS Winners. Why not get some AAS Winners for your gardener. I linked in their website. You can go there and look for the newest winners. They also have seed companies listed there that sell the winning varieties. Here are some videos I have done on AAS Winners. I recommend Sehychelles green beans, an oak leaf lettuce called Sandy and my favorite radish called Roxanne. Sometimes it is confusing to gift buyers when it comes to seed starting supplies and that is because the words cell, flat and trays are often used interchangeably. The basic supplies are seed starting mix, seed cells for holding the starting mix and seeds and seed flats to hold the seed cells. The best way to understand this is to show you. A gift box of seed starting mix, seed cells and flats make a wonder gift. I included my video so you can see how they are used. We use grow light to start seeds indoors for garden transplants. Tomatoes and peppers are often plants gardeners start indoors. The reason we do this is to get 6-8 weeks of growth indoors while the outdoors is still cold and full of frost. You can't effectively grow seedlings on a windowsill. They just don't get enough light. Grow lights will fix that problem. If you are handy, check out my video on how to build a grow light station and you can make a gift. I also included some systems you can buy from Amazon. You can get a single system for the first time indoor seed starter or a more elaborate system that will let them manage hundreds of seedlings and transplants. We always need twine which is often Jute. A natural product that breaks down. Tools such as a soil knife, pruners and hand shovels are always loved. You don't need to spend a lot on them. A mixed box of twine and tools will make a great gift. I have many videos on making your own potting or container mixes. But often people don't have the time to do that or they just want to have a wonderful container garden and get right to planting. I also have done plenty of videos on what makes the best container mix for our vegetables, herbs and flowers. The answers can be found in a single product called Good Dirt. I like to say it meets the three P's. It is the best product you can buy in a bag. Just Pour it, Plant it and Pick. It makes container gardening much simpler. It is perfect for the first time and seasoned gardener. Sometimes you just want to get to planting and don't want to worry about amending container mixes. Good Dirt solves that problem. Just pour it plant it and soon you be picking from it. Absolutely the best self watering container on the market and it comes with a 10 year warranty. I put it to the test and grew a cucumber tomato garden in a single container. It could go weeks without being watered. If you are looking for a quality high end gift that is absolutely fantastic, a TruDrop system is what I recommend. Here is my video on the system. The container every gardener wants. Burying eggs, fish bones, animal parts and other organic matter in compost holes, for garden fertilizer, has been done for centuries. A compost hole differs from a compost pile in that you let the organic matter decay beneath the ground in the planting area you will be growing vegetable plants. Compost piles sit above the surface and the organic matter decays over months and sometimes years. Compost is always king, if you have the space to make plenty of it. We always don't have the space and compost holes are a simpler alternative. Many of us spend a lot of money on organic fertilizers which are really no different than burying organic matter in a compost hole. Blood meal is freeze dried slaughter house blood. Bone meal is steamed crushed cattle bone. Fish emulsion is blended fish parts. Feather meal is pulverized feathers and the list of organic fertilizers follows this theme. They are typically, treated, blended and dried into a granule form. Once added to our gardens, soil life has to break the organic matter down into a plant useable form of Nitrogen, Phosphorus and Potassium as well as other elements. Burying an egg and banana follows the same biological processes. Using whole bananas and eggs as fertilizer, covers many of the major and micro-nutrients your vegetable plants will need. Dried banana peel is over 40% potassium. While they don't contain much in the way of nitrogen, they contain phosphorous, calcium, magnesium, sulfur, manganese and other elements and vitamins. Eggs certainly contain calcium. They also contain potassium, phosphorous, nitrogen, magnesium, zinc and copper. Calcium helps prevent blossom end rot in tomatoes. Worms will help digest this organic matter and leave worm casting behind that have their own benefits. Here is the video I just made using the compost hole. I buried the eggs and bananas down about 15 inches, as of October 1st. This is my fall preparation for two tomato plants that will grow above the compost holes. The garden has 6 months to break down the organic matter and get it ready for the tomato plants come spring. If this interests you, follow my YT channel as I will continue this series and show the growth of the tomatoes using only bananas and eggs as fertilizers through 2018. You can actually save a lot of money by using whole bananas and eggs in compost holes. You can also use flayed fish bones. You don't need to use ripe bananas or good eggs. Freeze your bananas the brown out and eggs that expire. You can go to grocery stores and ask about getting the old bananas and expired eggs. Many seafood places will have fish waste for you. Compost holes are an alternative to compost piles This practice has been around for centuries and is effective.